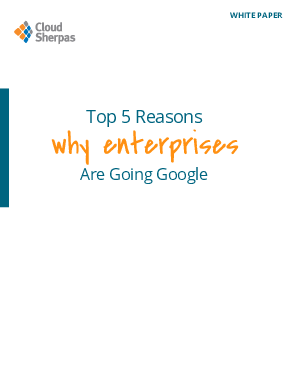 > Cloud Sherpas > Discover how top enterprises are preparing for tomorrow’s digital workplace today with Google Apps. Do you feel prepared to fend off a digital disruptor in your industry similar to Uber or Airbnb in the transportation and hospitality industries? Today, staying relevant requires you to prepare for the unknown competitor of tomorrow by thinking and responding to changing expectations like these emerging companies. But even if you can put yourself in their shoes, those future competitors have one huge advantage: They’re likely not burdened by legacy IT infrastructure, which means they can scale and respond to change faster. Many organizations like Jordache, Allrecipes and Coldwell Banker Howard Perry & Walston have addressed this disparity by adopting true cloud collaboration platforms like Google Apps for Work.